Published in Humanity, No. 2, December 1964. I originally intended to revise [this] thoroughly. 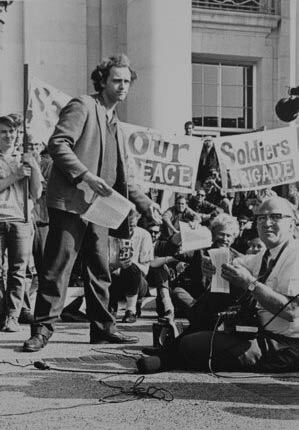 I have since changed my mind, deciding to have it reprinted as first taken from a tape made in Sproul Hall during the December sit-in. I find the article does not even conform to the subject of the title. But I also believe that a positive purpose would be served by preserving the text. In our free-speech fight at the University of California, we have come up against what may emerge as the greatest problem of our nation —depersonalized, unresponsive bureaucracy. We have encountered the organized status quo in Mississippi, but it is the same in Berkeley. Here we find it impossible usually to meet with anyone but secretaries. Beyond that, we find functionaries who cannot make policy but can only hide behind the rules. We have discovered total lack of response on the part of the policy makers. To grasp a situation which is truly Kafkaesque, it is necessary to understand the bureaucratic mentality. And we have learned quite a bit about it this fall, more outside the classroom than in. The most crucial problems facing the United States today are the problem of automation and the problem of racial injustice. Most people who will be put out of jobs by machines will not accept an end to events, this historical plateau, as the point beyond which no change occurs. Negroes will not accept an end to history here. All of us must refuse to accept history’s final judgment that in America there is no place in society for people whose skins are dark. On campus students are not about to accept it as fact that the university has ceased evolving and is in its final state of perfection, that students and faculty are respectively raw material and employees, or that the university is to be autocratically run by unresponsive bureaucrats. The things we are asking for in our civil-rights protests have a deceptively quaint ring. We are asking for the due process of law. We are asking for our actions to be judged by committees of our peers. We are asking that regulations ought to be considered as arrived at legitimately only from the consensus of the governed. These phrases are all pretty old, but they are not being taken seriously in America today, nor are they being taken seriously on the Berkeley campus. I have just come from a meeting with the Dean of Students. She notified us that she was aware of certain violations of university regulations by certain organizations. University friends of Student Non-violent Coordinating Committee, which I represent, was one of these. We tried to draw from her some statement on these great principles, consent of the governed, jury of one’s peers, due process. The best she could do was to evade or to present the administration party line. It is very hard to make any contact with the human being who is behind these organizations. The university is the place where people begin seriously to question the conditions of their existence and raise the issue of whether they can be committed to the society they have been born into. After a long period of apathy during the fifties, students have begun not only to question but, having arrived at answers, to act on those answers. This is part of a growing understanding among many people in America that history has not ended, that a better society is possible, and that it is worth dying for. This free-speech fight points up a fascinating aspect of contemporary campus life. Students are permitted to talk all they want so long as their speech has no consequences. The administration of the Berkeley campus has admitted that external, extra-legal groups have pressured the university not to permit students on campus to organize picket lines, not to permit on campus any speech with consequences. And the bureaucracy went along. Speech with consequences, speech in the area of civil rights, speech which some might regard as illegal, must stop. Many students here at the university, many people in society, are wandering aimlessly about. Strangers in their own lives there is no place for them. They are people who have not learned to compromise, who for example have come to the university to learn to question, to grow, to learn—all the standard things that sound like cliches because no one takes them seriously. And they find at one point or other that for them to become part of society, to become lawyers, ministers, businessmen, people in government, that very often they must compromise those principles which were most dear to them. They must suppress the most creative impulses that they have; this is a prior condition for being part of the system. The university is well structured, well tooled, to turn out people with all the sharp edges worn off, the well-rounded person. The university is well equipped to produce that sort of person, and this means that the best among the people who enter must for four years wander aimlessly much of the time questioning why they are on campus at all, doubting whether there is any point in what they are doing, and looking toward a very bleak existence afterward in a game in which all of the rules have been made up, which one cannot really amend. It is a bleak scene, but it is all a lot of us have to look forward to. Society provides no challenge. American society in the standard conception it has of itself is simply no longer exciting. The most exciting things going on in America today are movements to change America. America is becoming ever more the utopia of sterilized, automated contentment. The “futures” and “careers” for which American students now prepare are for the most part intellectual and moral wastelands. This chrome-plated consumers’ paradise would have us grow up to be well-behaved children. But an important minority of men and women coming to the front today have shown that they will die rather than be standardized, replaceable and irrelevant.